Pentatonic scales are bult with five tones. They are used in all many styles of music. Present in jazz and blues music since their origins, they are the most important scales in jazz music. The minor pentatonic scale is the fifth mode of the major pentatonic scale (there are five different modes). It is the first scale to know for a guitarist who wants to explore the wide world of improvisation. 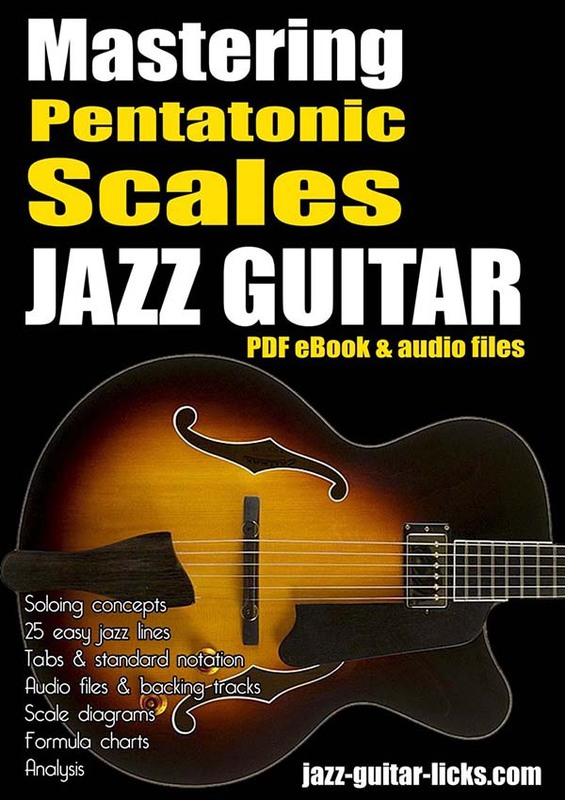 Indeed, the minor pentatonic scale very is easy to remember, easy to play and it sounds very good on a modal tune or a jazz blues (listen to Kenny Burrell or Grant Green). What is The Formula For The Minor Pentatonic Scale? 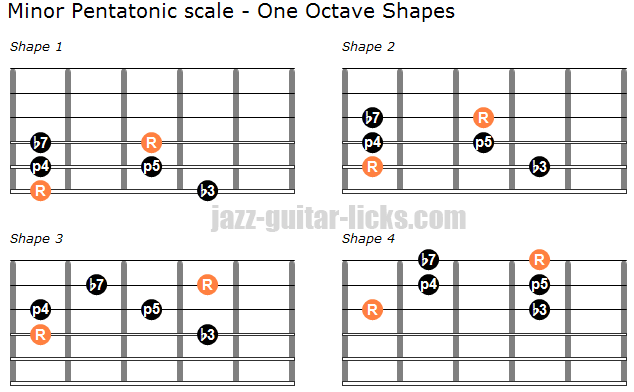 As its name implies, the minor pentatonic scale is made of five notes ("penta" means "five and tonic means "notes"). Giving the interval pattern Root (1) - minor third (b3) - fourth (4) - fifth (5) - minor seventh (b7). What is the Relative Major? The minor pentatonic scale as a relative major which is the major pentatonic scale. It means that these two scales have the same notes. The minor pentatonic scale starts on the sixth of the major scale. Conversely, the major scale starts on the b3 of the minor scale. There are many ways to play the minor pentatonic scale on guitar. The most simple is to play it within the space of one octave starting from the root note (R). Ascending and descending. You see that the diagrams have the lowest root on the sixth, fifth, fourth and third string. Try to play them in all twelve key by associating chords. These two guitar neck diagrams show you how to play the minor pentatonic scale within two octaves in order to cover the six strings. The minor pentatonic scale can be learned using what is called "Boxes".The five boxes on the shape represent one minor pentatonic scale position. This technique is very handy when you want to practice diagonal playing and position shifts. Basically the minor pentatonic scale is played over minor chord types as : minor (m), minor 7 (m7), minor 11. But they can be used over dominant chords for a bluesy sound : dominant 7th (7), dominant 7th sharp ninth (7#9). Here are some chord shapes that match with the minor pentatonic scale. How to Combine Minor Pentatonic Scale With Chords? Here are three example on how to mix a minor pentatonic scale with chords. This is a transcription of Kenny Burrell's guitar solo in "Chitlins con carne" from the album midnight blue. Kenny Burrell played this line over the I7 chord of a twelve bar blues in C (Chitlins con carne) . You can listen to it in this video. Here is a soul, jazz guitar lick using notes from the Bb minor pentatonic scale (Bb - Db - Eb - F - Ab). It starts and ends with a perfect fourth (F-Bb). This lick is taken from the 25 SOUL JAZZ GUITAR LICKS eBOOK. This line shows you how to use the E minor pentatonic scale over the ii chord of a II-V-I progression.